2018 brings Funko Five Nights at Freddy's Mystery Minis Series 3! This means new miniature blind-box options for The Twisted Ones and Sister Location. The follow-up to Series 2, which concentrated mainly on Sister Location (the fifth installment for the video game), Series 3 mixes new Sister Location figures with choices from The Twisted Ones, which is the second FNaF novel. Although most put the Mystery Minis spin on the larger Pop! editions, there are several vinyl debuts. Buy Five Nights at Freddy's Mystery Minis on Entertainment Earth. 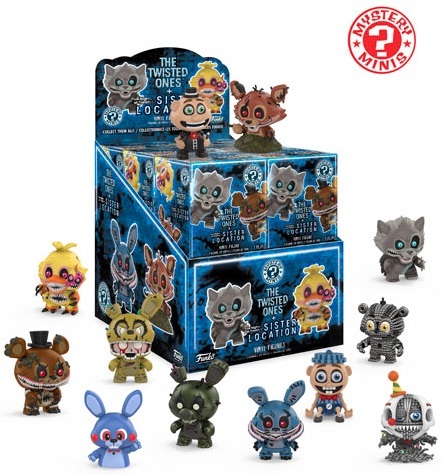 Naturally, Funko Five Nights at Freddy's Mystery Minis Series 3 has "Twisted" versions for many of the characters. In addition, there are three retail-specific formats, each with a trio of exclusives, bringing the total to at least 21 figures to track down. 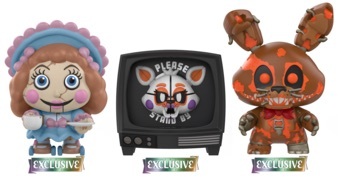 Collectors can find the Paper Plate Pals, RXQ (a.k.a RWQFSFASXC) and Theodore at GameStop, while Bonnet, Nightmare and Stanley are only issued in Hot Topic boxes. Also, Walmart is the place to visit for the exclusive Ella, Jack-O-Bonnie and Lolbit versions. Like all Mystery Minis releases, the packaging keeps the contents a surprise, making for an exciting, albeit more difficult, set to to build. Full box odds and rarity info will be added when confirmed. Stay updated on other Funko Five Nights at Freddy's figures with our detailed guides. Was curious, does CC have a char form that discusses funko blind box weights and layouts?